Vancouver, British Columbia / TheNewswire / November 27, 2017 - Harvest Gold Corporation (TSX.V:HVG) ("Harvest Gold" or the "Company") and Evrim Resources Corp. ("Evrim") (TSX.V:EVM) are pleased to announce the completion of the phase one exploration program at the high-grade Cerro Cascaron gold-silver project in Mexico. The combined Evrim/Harvest geological teams have begun the work to define drill targets and will meet in Vancouver next week to finalize and prioritize these targets. The Cerro Cascaron project covers 69 square kilometres in a historic Colonial-era mining district in the prolific Sierra Madre Occidental ("SMO") precious metals belt of western Chihuahua State. Harvest Gold has the right to earn up to an 80% interest in the Project by incurring certain exploration expenditures, making cash and share payments and delivering a 43-101 compliant feasibility study. 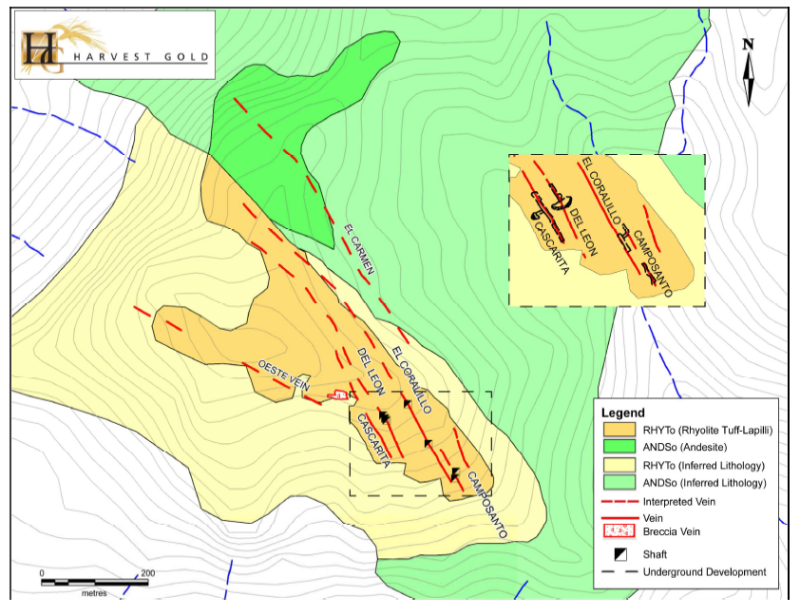 Harvest Gold's President and CEO Rick Mark states: "The phase one exploration program at Cerro Cascaron has successfully demonstrated the size potential of the Cascaron vein field with extensions of all veins to the north of high-grade gold sampled in old workings. The latest sampling of ore grades and widths at the silver-rich Cascarita prospect presents an exciting new development." 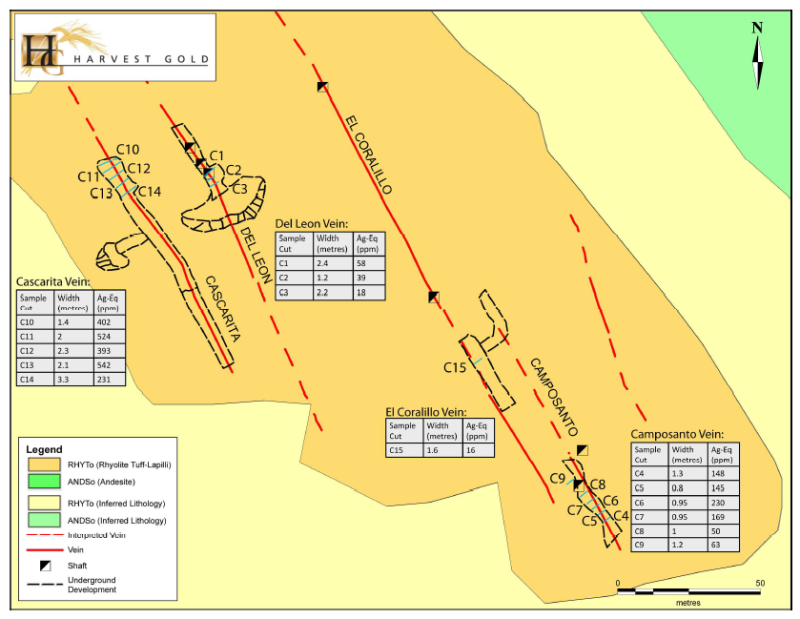 Vice President of New Opportunities and Exploration for Evrim, Charles Funk commented: "The phase one exploration program at Cerro Cascaron has successfully demonstrated the size potential of the Cascaron vein field with extensions of all veins to the north of high grade gold sampled in old workings. New sampling at the silver rich Cascarita prospect of ore grades and widths is an exciting new development. We look forward to Harvest Gold progressing to test these drill ready targets in early 2018." In the Cascarita area, six vein systems are present within a 900 metre by 300 metre corridor of northwest-striking structures. The fault-bounded structures attain appreciable widths of up to 3.3 metres with associated and locally extensive zones of stockwork veining up to 20 metres wide that locally link parallel structures. Mineralized structures comprise dominantly quartz?barite breccia-veins with polymetallic sulphides. Quartz textures include colloform and drusiform quartz and local amethyst. Boiling textures are present as quartz pseudomorphs after bladed calcite at the Coralillo Vein. Polymictic breccias that locally include quartz vein fragments suggest significant reactivation and movement along faults. Significant base metal sulphide development is reflected by very high lead and zinc with anomalous copper, arsenic and antimony geochemistry. Veins and sampling locations are shown in Figures 1 and 2. A soil sampling program was completed over the Cascaron vein field area to define the extension of the veins northward and at a higher elevation. Earlier Evrim sampling had demonstrated high gold grades along the base of a silicified rhyolite tuff cliff with common old workings and prospecting had suggested northern extensions to these veins. The soil sampling program was successful in extending all veins by 600 metres to 1,800 metres in strike length. Importantly the veins occur at higher elevations above the boiling zone where high gold grades are sampled. Drilling these veins at the same elevation as the old workings is the next exploration step. The sampling program defined two new vein corridors that follow-up mapping confirmed as quartz/calcite veins labelled El Salto and El Tascate. 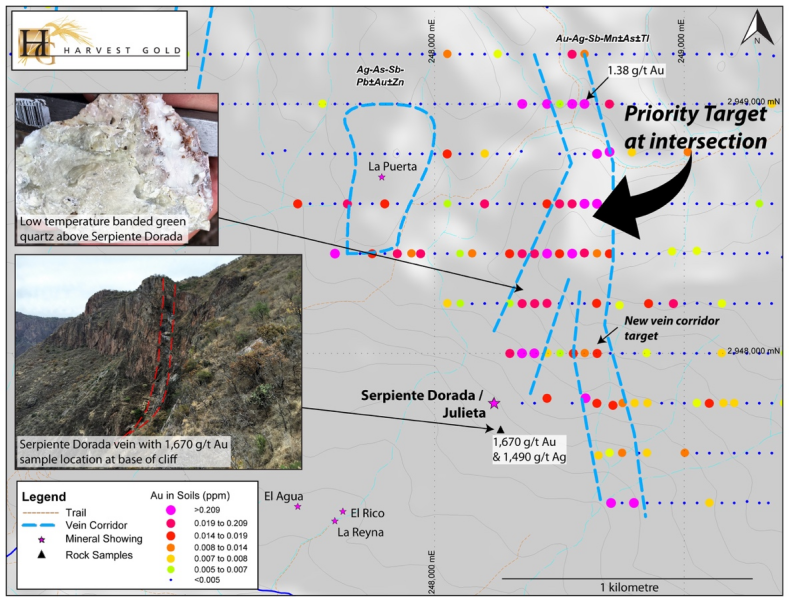 A 1.8km long, very prominent gold in soil vein corridor north and east of the Julieta and Serpiente Dorada veins includes a sample that assayed 1.38 grams per tonne (g/t) and is a high priority target for drill testing. The geology in the area of the Cascaron vein field is lithologically and structurally complex. The uppermost and youngest lithology of the vein field comprises ignimbrites of the Upper Series Sierra Madre Occidental Volcanics. The ignimbrites overlie a conformable package of rhyolitic tuffs and pyroclastic horizons with intercalated fine-grained tuffs. This dominantly felsic volcanic package in turn overlies a series of andesite flows with intercalated basalt flows. The intercalated andesite/basalt flows overlie andesite flows and rhyolite flows. A series of aphanitic rhyolitic dykes that locally exhibit flow textures, cut the whole volcanic sequence except for the igmimbrites and the rhyolitic tuffs of the upper part of the SMO. Overall, mineralization in the soil and rock geochemical corridors corresponds to quartz and calcite veins with low temperature textures indicative of the highest levels of the epithermal system. Limited wallrock alteration also suggests that the structures are high level exposures. The quartz veins have well-defined structural controls. Readers should refer to Evrim's press releases dated June 8 and August 17, 2016 and Harvest Gold press releases dated June 8 and 15 and October 5 and 18, 2017 for a full description of previous exploration results.